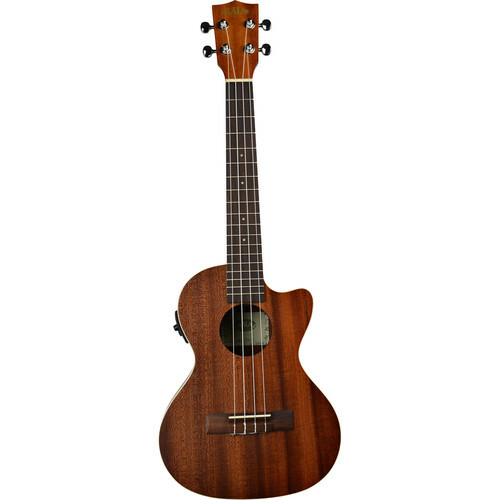 The KA-TE-C Satin Mahogany Tenor Cutaway Ukulele with EQ from Kala is made from a Mahogany top, back and sides, with cream binding, and a satin finish. The ukulele's neck is mahogany and the fingerboard and bridge is made of rosewood with white dot inlays. The instrument offers a powerful and balanced sound, well suited for solo performance or playing with a full band. In addition, this tenor ukulele is built with a standard headstock, a Graph Tech NuBone nut and saddle, and UK-300TR electronics. Box Dimensions (LxWxH) 27.3 x 11.0 x 4.0"
KA-TE-C Satin Mahogany Tenor Cutaway Ukulele with EQ (Satin) is rated 5.0 out of 5 by 1. Rated 5 out of 5 by Wright from Worth every penny Excellent sound and playability. Pickup is clear and crisp. Perfect as an accoustic as well.